In 2018 His Holiness Drikung Kyabgon Chetsang Rinpoche, Supreme Head of the Drikung Kagyu Lineage, established the Great Shravasti International Buddhist Cultural Assembly. 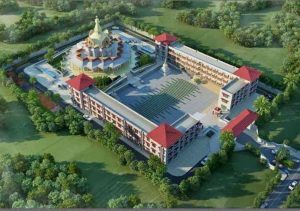 In 2019, he is hosting the first Vassa or Rains Retreat assembly of Venerable Bhikkus from Theravada countries in the spectacular new temple on the sacred grounds at Shravasti. 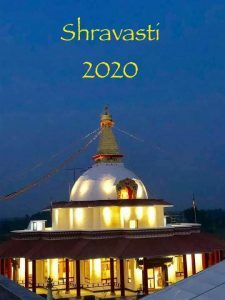 In 2020, it is his sincere wish to host Mahayana Bhikkhunis who follow the Dharmaguptaka Vinaya tradition in the traditional Rains retreat. This retreat is fully sponsored by His Holiness Drikung Kyabgon Chetsang Rinpoche. Shravasti is one of the four avijahitatthanam – ‘unchangeable spots’ in the lives of all Samma Sambuddhas. This is the holy place where our Supreme Buddha spent 25 Vassas or summer rain retreats. The remains of Jetavana monastery and Purvaram Vihara and the Ananda Bodhi tree are inspiring places to worship and remember the Supreme Buddha who preached many discourses in this place. A Mahayana monastery has been built about 1 KM from this holy spot by His Holiness Drikung Kyabgon Chetsang Rinpoche and inaugurated in 2018. It is the supreme wish of His Holiness to organize a Vassa or Rains Retreat among the Mahayana Bhikkhuni Sangha of 64 Bhikkhunis in 2020. 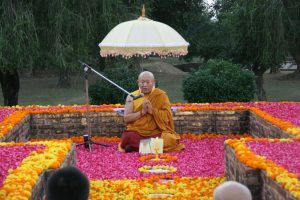 The main purpose of this program is to bring together Mahayana Bhikkhunis in the Dharmaguptaka tradition from different countries and traditions and live harmoniously for one Vassa and learn from each other, and to vitalize the power of Dhamma in this new monastery for the good of future monastic and laity. 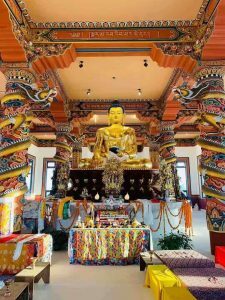 We respectfully with folded palms invite the Venerable Bhikkhunis of Vietnam, Taiwan, Korea, China and the West to take up VASSA in this holy place of SAVATTHI, India, where Supreme Buddha spent 25 Vassas. There will be Kathina Civara Offering after the Vassa within a week following the retreat. The program will host 64 Bhikkhunis, from the countries of Vietnam, Korea, Taiwan, China and US/Europe. The nuns will be guided by Elders representing Vietnam, Korea, Taiwan, China and the United States. One elder nun, nominated from each group, will be invited to give a series of Dharma talks. We are in the process of forming a planning committee to determine the curriculum of the retreat and how the needs of each country’s tradition and study can be held with respect. This committee will announce dates and the application process. A suitable time table will be made. There are suitable places for meditation, study and Sima for bhikkhuni procedures. It will be a rare opportunity for bhikhunis from different countries to live together and share their knowledge and experiences on the path of Dharma. Shared double rooms are available. Medical care and all other needs for the Bhikkhunis will be provided. The transportation from respective countries will be provided along with healthy food and pure water. We are exploring a pilgrimage opportunity following the retreat.